Wow, so goofy I would never dream of going, but the man is a legend. A concert of Neil’s songs performed by Neil and many friends. 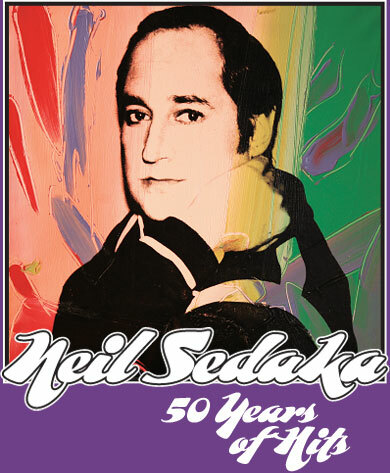 Natalie Cole, Connie Francis, Clay Aiken, Dion, Captain & Tennille, Paul Shaffer, David Foster, Renee Olstead, The Bad Plus, Cousin Brucie Morrow, Lou Christie, and, of course, Neil Sedaka! All proceeds benefit the Elton John AIDS Foundation. I’d love to be there tonight! Sedaka, David Foster, Clay Aiken on stage – what a delightful cocktail of amazing talent. Too bad this isn’t being televised. What a great lineup. I guess Clay Aiken will be singing Solitaire He does a fantastic job on this. You read my mind Molly and Kelly. “Would never dream of going.’ Why? Don’t you appreciate great music?? I just came back from an overnight trip to CT. Friend and I took the train into NYC to attend this amazing show. What a thrill is was to see performing live some of the singers I grew up with (born 1951). Connie Francis-looked and sounded amazing,Lou Christy, Dion-very funny guy!, Captain and Tennille -Toni looked better than she sounded. Natalie Cole, nothing less than true class. Newcomer, Renee Olmstead was great beyond her tender years (18). Paul Schaffer was great. David Foster was a lot of fun. Cousin Brucie Morrow was great as the Emcee-met him after the show; nice guy and nicer toupee!! Some jazz trio butchered Laughter In The Rain—what were they doing?????? On a jumbotron they should a taped piece by Elton John, who’s AIDS foundation all net proceeds will be going. Elton, who is in Vegas, gave a tribute to Neil and sang a little of one of Neil’s songs. Clay..what can I say about Clay? Blew the rafters off the theatre. Clay was 1 of only 3 performers to receive standing O’s. Actually Clay got 2! People who have never seen him perform were mesmerized and awestruck. His performance of Solitaire (got Neil crying again!!) should be up on youtube.com He also looked fantastic-took off a few pounds, hair looked great. Clay will also be taking over the role of Sir Robin in Spamalot on Broadway from Jan-May!!!!! Also put up on the jumbotron was a tribute to Neil by Barry (DIVA) Manilow. He mentioned his new cd of 70’s covers and said that he even recorded Solitaire for it—hmm Barry, did amazon.com forgot to list that with all the other songs?????? Not on the cd and there isn’t even a Sedaka song on it! David Foster made the comment after-‘Gee Barry, I think someone else (meaning Clay) recorded that BEFORE you!’ That garnered lots of laughter and applause! Connie Francis got 2 standing O’s and of course the rest were for the amazing Neil. Neil’s voice was sheer perfection. This guy is almost 70??? What a wonderful tribute to a true mensch (look it up on wikipedia.com!! )and, of course, a true, true legend.